Have you always wanted to set a large goal for yourself but are afraid to even give it the time and energy to create the plan to achieve it? Maybe you had a dream but at some stage you gave up on it because you saw no way of fulfilling it? Or you simply decided it’s time to grow up and stop dreaming. Walt Disney was right in his quote above. Our dreams can come true and there is a strategy to achieve them. 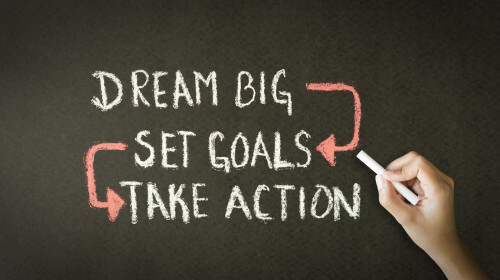 Here are three simple steps how you can make your dreams a reality. There is a creative form of energy and it manifests itself as our imagination. When activated, it is able to build clear and vivid images. When we dream, our minds are filled with illogical thoughts like levitating or being outside in a bathing suit while it is snowing and not feeling cold. When building an idea, we need to not concern ourselves with the “How”. First we must build the image and then the “How” will reveal itself to us. We want to keep our mind free of clutter so we can build this picture in colour – be able to use our senses to bring it to reality. Now that we have the image, we have to commit to being able and willing to create this. This is where we step outside of our comfort zone and move beyond the limits of our belief system. This is where doubts try to infiltrate our minds creating fear and then ultimately we give up on our dreams. Questioning “how” is pointless as you couldn’t possibly know how since you have never done this before; so let the need to know go, and continue to focus on the image. Once the commitment is set and you are willing and able to move forward, the idea moves into the next phase of the process and turns into a goal. From here the image is moved to the subconscious mind as emotions form and attach to the idea turning it into physical form. The idea and you begin to merge and your vibrations change, causing behaviors to change. These changes start an attraction force that builds your awareness of the opportunities that have always been there but are now visible and in line with your goal. Through faith and a belief in this idea, you have moved what was once a dream into a reality. Getting started is often the hardest part of the success journey, so it is important you make a firm decision that you do want to achieve your dream and in order to do that you are willing to change some of your behaviour. Find a quiet place, eliminate all distractions and spend about half an hour every day thinking about your dream. Don’t be afraid of dreaming big. Create the picture of a perfect you in your mind and hold that image. Do it until the picture is clear and you absorb every detail of your dream. You may also create a vision board of your dream, but definitely start writing a journal. This is important because writing activates your subconscious mind and helps you identify the next step you need to make. Ask yourself what can I do today that will take me one step closer to my final goal and …then simply follow the path that opens for you. No deed is too small, just keep moving. You may need the support of a friend or a mentor to help you stay motivated.